Rather than just post little rundowns of days when I'm out photographing, with a selection of fairly average images, I thought I'd also try and introduce a couple of other features on this blog. The first of these is going to be a (hopefully) regular series where I talk about one image, and how I captured it. The posts won't be that long, but I'm hoping they will give a bit more insight into what I wanted to capture, and then how I went about it, etc. So, for the first post I'll go with something recent, taken during the heavy snowfall that we had a couple of weeks ago. Living in London means I rarely get the chance to photograph in the snow, and although I've spent much of the last three years at university in Durham I've never had my camera up with me, for a variety of reasons, the main one being that I've not had a car, making getting around very difficult. This year that all changed, however, so I've been trying to get out on weekends to see some of the wildlife around the area. It's been great being able to get out and photograph wildlife that I don't really see at home, such as some of the coastal birds, but I've really been hoping that I would get the chance to photograph in snow. When I saw the forecast for snow a couple of weeks ago, however, I suddenly realised that I wasn't really sure where I would go. Back home in London I have a pretty good knowledge of local spots, just from having spend so many years with the area as my stomping ground. Up in Durham it's a different story though, and so far I've spent most of my time out with a camera on the coast. I was reluctant to head out there in the snow for two reasons: firstly it doesn't tend to settle as well there, and secondly I wasn't sure that all the roads would be cleared and didn't want to hit a dead end en route! I decided to head to a nature reserve close to me instead, to see what I could find there. What I was really after was images of wildlife against a background entirely composed of snow, preferably small in the frame too. While I was driving to the reserve I made sure to check each field I passed for any wildlife in it. Almost all of them held nothing, until I'd almost reached the reserve, when I saw 3 partridges stood out in the open of a white canvas. Unfortunately I didn't have time to stop with people behind me, so drove on and turned around. Finding someone to pull over, I grabbed my camera from the passenger seat. As they were distant I wasn't convinced that my D850's metering would do a great job of exposing for them against the bright white snow, so I switched to manual mode and took some test shots until I was happy with the exposure. 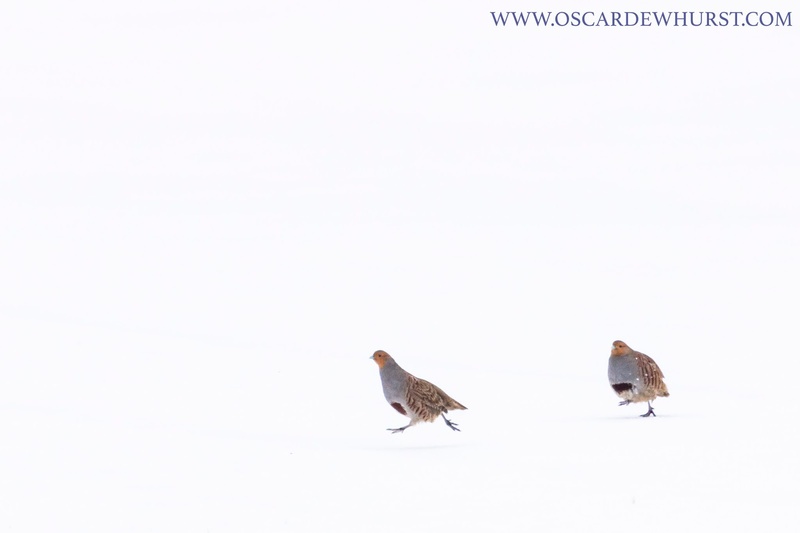 I started off taking some images of single birds standing on the snow, but then noticed that two kept chasing each other round so turned my attention to this. I had to crank up my ISO to get a decent shutter speed, but luckily my new D850 has turned out to be significantly better at shooting at high ISOs, so my choice of ISO 2000 meant the images were still fairly clean. I spent a few minutes photographing the two birds as they chased each other around the field, but before long they all retreated back into the cover of the hedge splitting the fields up. Luckily I had got the images I wanted though. As it turns out I saw very little at the nature reserve, so a stroke of luck in spotting these turned out to result in some of my only photos that day! I did manage some other photos in the snow the day before, but these were the only ones where the background is entirely snow. Amazingly, given we're nearly in April, the snow's been pouring down over the last couple of days too so I had another chance this morning which was much appreciated! Thanks for reading, and I'll be back next week with another Behind The Image post.